Textiles and travel stories. Antigua Guatemala. After weeks of classes I now have a little time to enjoy the ambience of Guatemala. Jim West and I are doing a little research into Textile Tours for Textile Artists and both of us arrived in Antiqua yesterday. Jim had the trip from hell that sounded like a bad movie, mine began at 3.30 am and I arrived at 10.00 pm. It was a really long day, and we didn’t catch up until breakfast. Jim had been out walking early this morning and the excitement on his face told me that really we where in for a treat. Its difficult when you arrive in a strange place at night, it’s quite surreal in a way. But the sun in the morning, the fresh air and the smell of coffee made it the heart sing. All was well. Our last tour was the legendary Kenyan tour in November, so we had a lot to catch up on over breakfast. Down cobblestone streets, flanked by brightly painted houses, with doors that held secrets. Our first stop was very close to the hotel and it was the most amazing gallery with antiques and textiles. Casa De Artes. We chatted with the proprietors for some time and she told us the history of some of the antique statues I share here. The next stop was the textile market and it’s almost too much to take in. We stopped for a welcome coffee. This image was shot out of the window just as a ceremony began in the square. Through the square and on to Saint Joseph Cathedral. The original church was built around 1541, but suffered several earthquakes throughout its history, and the first church building was demolished in 1669. The cathedral was rebuilt and consecrated in 1680. By 1743 the cathedral was one of the largest in Central America. However, the devastating 1773 Guatemala earthquake seriously damaged much of the building, though the two towers at the front remained largely intact. These have undergone restoration work, and the cathedral has been partly rebuilt.San Francisco Church. 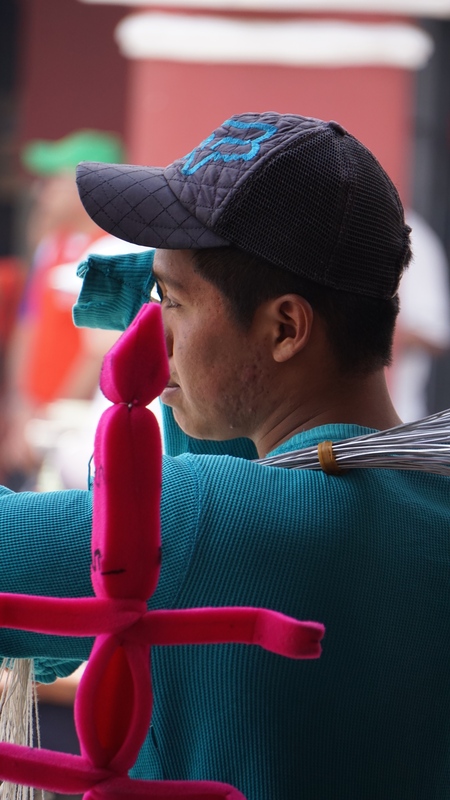 We came upon markets, cultural expos and so many things of beauty that our heads were spinning. We took lunch at a Peruvian Restaurant. We had the traditional Pisco Sour. Jim had seafood and I had squid in an olive sauce and chicken and rice. It was superb. The owner bought us a complimentary dessert called the “sigh of sorrow” he told us a woman waiting for her husband to return from war would wait for him at the window each day and sigh when there was no sign of him. On the news of his death she created this delicious desert of condensed milk cooked and meringue on top.! 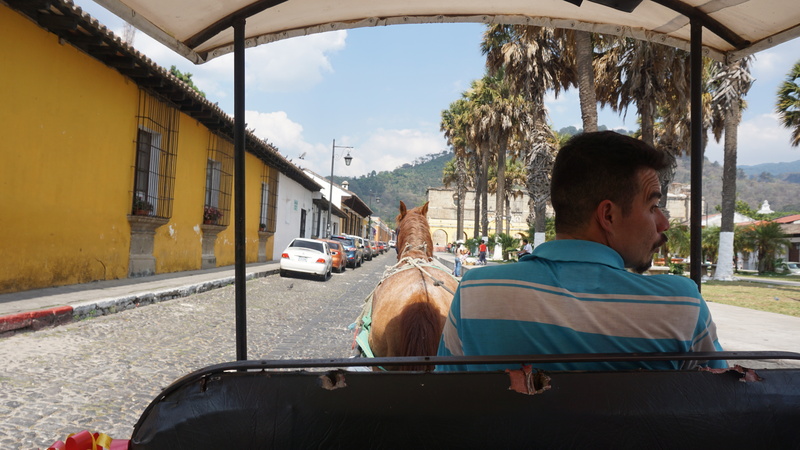 We walked the streets, caught a horse and buggy and rattled over the cobblestones. Past houses with stories stored in their walls and windows to surprise you. The washing fountains were fascinating. And of course we met a lot of people. We spent the evening, going over our images, and eating delicious lamb…. now I need to sleep in preparation for another exciting day. Tagged with: Antiqua, capture and create, photo journal, Photography., travel stories, Travel. Wow, the fabrics have amazing colours and patterns! Thanks Jim, is been great. Thank you for your inspiration too. Previous PostThe Ode to travel. Next PostTextile art and the way I look at color.